Aeromotive Fuel Pump - Billet Drive UNIVERSAL - Dezod Motorsports Inc - Home of the automotive performance enthusiast since 2002. Zero amperage draw, less weight, and more flow! 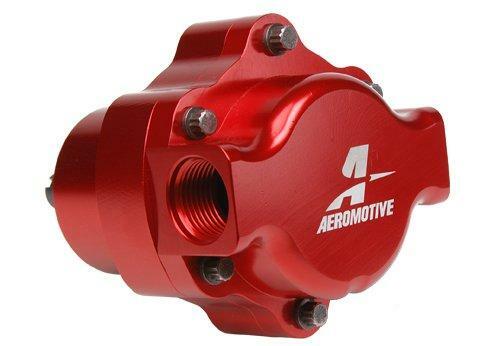 The Aeromotive Billet Belt Drive Fuel Pump was designed to solve fuel delivery problems in high horsepower, forced-induction EFI applications, and is now very popular in carbureted applications as well. Proven performance, powering some of the worldʼs fastest EFI vehicles. The Aeromotive Billet Hex Drive Fuel Pump features Zero amperage draw, less weight, and more flow, providing the same unparalleled performance you get from our Billet Belt Drive Fuel Pump (P/N 11105), with the added convenience of direct drive. Can be mounted and driven directly from the back of a properly prepared external oil pump or driven directly by the cam through a timing cover adapter. Aeromotive belt and hex drive pumps are the ultimate solution to fuel delivery problems in high horsepower, forced-induction EFI applications, and are fast becoming the pump of choice in carbureted applications as well. Proven performance, powering some of the worldʼs fastest vehicles.